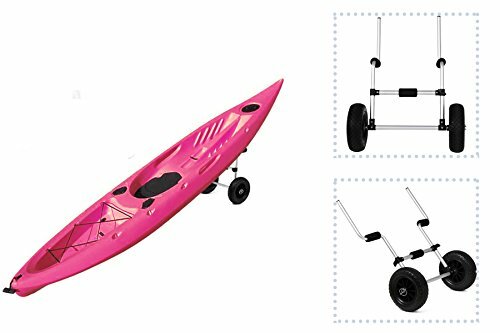 eXXtra Store Canoe Kayak Scupper Adjustable Aluminum Dolly Cart Carrier Trolley Sit-On-Top + eBook by eXXtra Store at Our DXC. MPN: 7179870. Hurry! Limited time offer. Offer valid only while supplies last. Product Description: Made from durable Aluminum frame and premium rubber bumper. Designed to fit kayak with scupper holes at least 3/4'' in diameter. Made from durable Aluminum frame and premium rubber bumper. Designed to fit kayak with scupper holes at least 3/4'' in diameter. Spraying powder coated surface ensures it stable and robust. Ideal for moving and carrying kayak and inflatable boat. Features with strengthen rubber bumper for undesired scratching. Contains two durable 24cm/9.4'' wheels w/2 pins for easy mobility. Built in solid structure with high capacity up to 54.4Kg/120Lb. Lightweight design, easy to carry and transport.